Bob Tannenwald has practiced applied public economics for almost 40 years. Prior to joining the Heller School's faculty, he was a Senior Fellow with the Center on Budget and Policy Priorities. He spent most of his career--28 years--as an economist and officer at the Federal Reserve Bank of Boston. He began his career as an analyst with the Congressional Research Service, Library of Congress. In the 1970s, when Bob first started out, he was struck by the lack of communication between academic experts in public finance, especially at the state and local level, and policymakers, policy advisers, and reporters seeking impartial, expert advice and analysis. As a result, has served as a member and/or research director of five state tax commissions in New England,and has testified scores of times around the nation at federal and state public hearings on fiscal issues and economic and financial conditions. In addition, he has published many articles, book chapters, and reports. He has been frequently invited to give presentations at conferences, symposia, and webinars, both in the U.S. and abroad. In 2005, Bob had the opportunity to create the New England Public Policy Center, a unit within the Boston Fed explicitly dedicated to providing the region's policymakers, their advisers, members of the media, and policy advocates with high quality, impartial analysis in the areas of state and local public finance, demographics, and labor market conditions. 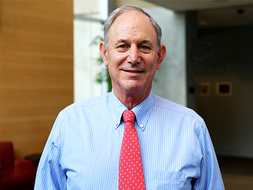 After founding the Center, Bob served as its director for five years, until his retirement from the Fed in 2010. Bob has been active in the National Tax Association, serving as its President in 2007, the Association's centennial year. He also served as a member of the Board of Directors of the New England Economic Partnership. Bob has been a columnist for State Tax Notes, a weekly magazine specializing in state and local tax policy since 2013. Tannenwald, Robert. "State and Local Tax Issues to Remember from 2017 and to Look for in 2018." State Tax Notes January 22, 2018. Tannenwald, Robert. ""A Second Response to Dan Bucks on Public Finance Scholarship"." State Tax Notes September 11, 2017: 1055-1059. Tannenwald, Robert. ""The Latest Report on Massachusetts's Film Tax Credit"." State Tax Notes March 13, 2017: 935-937. Tannenwald, Robert. ""A Response to Dan Bucks's Critique of Scholarship in U.S. Public Finance"." State Tax Notes June 27, 2016: 1031-1034. Tannenwald, Robert. ""MPAA Scorches USC Over Film Incentive Study--Who's Right?"." State Tax Notes October 17, 2016: 191-192. Tannenwald, Robert. ""Was Landing General Electric Really a Win for Massachusetts?"." State Tax Notes 79. (2016): 963-968. Tannenwald, Robert. ""4 State and Local Issues to Remember from 2015"." State Tax Notes 78. (2015): 795-796. Tannenwald, Robert. ""Do 'Taxes Matter? ': The Latest from the Tax Policy Center and CBPP"." State Tax Notes 76. (2015): 921-923. Tannenwald, Robert. ""Massachusetts Film Credit Fact Check"." State Tax Notes 76. (2015): 603-605. Tannenwald, Robert. "Criticism of State Tax Incentives Is Essential." State Tax Notes 71. 7 (2014): 415-418. Tannenwald, Robert. "Adieu Depardieu: the ‘Tax Flight’ Debate." State Tax Notes 68. (2013). Tannenwald, Robert. "Concerns About the Tax Foundation's Business Climate Index." State Tax Notes 67. 8 (2013): 601-610. Tannenwald, Robert. "In the Tax Flight Debate, Correlation Does Not Causation Make." State Tax Notes 70. 4 (2013): 255-256. Tannenwald, Robert. "State Tax Reform: a Tale of Three Governors." State Tax Notes 69. (2013). Tannenwald, Robert. "The Changing Tune of COST's Business Tax Study." State Tax Notes 69. 11 (2013): 665-572. Tannenwald, Robert. "“Studio 38 Again: More Lessons Learned”." State Tax Notes 68. (2013). Yilmaz, Yesim, Sonya Hoo, Matthew Nagowski, and Kim Reuben and Robert Tannenwald. "Measuring Fiscal Disparities Across the U.S. States: A Representative Revenue System/Representative Expenditures System Approach, Fiscal Year 2002." April 2006. Tannenwald, Robert, Jon Shure, and Nicholas Johnson. "Tax Flight Is a Myth: Higher Taxes Bring More Revenue Not More Migration". Washington, DC Center on Budget and Policy Priorities: 2011. Tannenwald, Robert. "States Have Better Tools Than Tax Cuts to Attract Jobs." Capitol Ideas (Council of State Governments) May/June 2011. Lav, Iris and Robert Tannenwald. The Zero Sum Game: States Cannot Stimulate Their Economnicy by Cutting Taxes. Washington, DC Center on Budget and Policy Priorities: 2010. Mazerov, Michael and Robert Tannenwald. "Flawed Study Should Be Goven No Credence in Evaluating Jobs and Revenue Impact of California Tax Break". Washington, DC Center on Budget and Policy Priorities: 2010. Tannenwald, Robert. "Is the Sales Tax Becoming Obsolete." Regional Economic Development (Federal Reserve Bank of St. Louis) 1 (2010): 108-114. Tannenwald, Robert. "State Film Tax Credits: Not Much Bang for Too Many Bucks". Washington, DC Center on Budget and Policy Priorities: 2010. Tannenwald, Robert and Nicholas Turner. Water, Water Everywhere. Dare I Drink a Drop. Boston, MA New England Public Policy Center, Federal Reserve Bank of Boston: 2005. Tannenwald, Robert. "Are State and Local Revenue Systems Becoming Obsolete." National Tax Journal 55. 3 (2002). Tannenwald, Robert. "Interstate Fiscal Disparity in 1997." New England Economic Review Third Quarter 2002 (2002). Tannenwald, Robert and George Plesko. "Measuring the Incentive Effects of State Tax Policies Toward Capital Investment." October 2001. Tannenwald, Robert. "Devolution in the United States: Theory and Practice." Fiscal Rules, Perugia, Italy. Bank of Italy, February 1-3, 2001. Tannenwald, Robert. "The Neutrality of Massachusetts' Taxation of Financial Institutions." New England Economic Review May/June (2000). Tannenwald, Robert, Christopher J. O'Leary (W.E. Upjohn Institute), Wei-Jang, and Pei-Zhu. "New Ways of Evaluating Unemployment Insurance." New England Economic Review March/April (1999). Tannenwald, Robert, Joe J Cordes, Robert D. Ebel, and Jane G. Gravelle. "Tax Competition." The Encyclopedia of Taxation. First ed. One vols. 1999. Tannenwald, Robert. "Book Review." Rev. of Financing Federal Systems: the Selected Essays of Edward M. Gramlich, by Edward M. Gramlich. Publius: the Journal of Federalism vol. Winter 1999: 157-160. Tannenwald, Robert. "Fiscal Disparity Among the States Revisited." New England Economic Review July/August (1999). Tannenwald, Robert. "Come the Devolution, Will States Be Able to Respond." New England Economic Review May/June (1998). Tannenwald, Robert. "Devolution: the New Federalism--An Overview." New England Economic Review May/June (1998). Tannenwald, Robert. "Implications of the Balanced Budget Act of 1997 for the "Devolution Revolution"." Publius: The Journal of Federalism 28:1. Winter (1998). Tannenwald, Robert with Jonathan Cowan. "Fiscal Capacity, Fiscal Need, and Fiscal Comfort among U.S. States." Publius: the Journal of Federalism 27-3. Summer (1997). Tannenwald, Robert, Christopher J. O'Leary, Wei-Jang, and Pei Zhu. "Unemployment Insurance Policy in New England: Background and Issues." New England Economic Review May/June (1997). Tannenwald, Robert, Katharine Bradbury, and Yolanda Kodrzycki. "The Effects of State and Local Policies on Economic Development: An Overview." New England Economic Review March/April (1997). Tannenwald, Robert. "State Regulatory Policy and Economic Development." New England Economic Review March/April (1997). Tannenwald, Robert. "State Business Tax Climate: How Should It Be Measured and How Important Is It." New England Economic Review January/February (1996). Tannenwald, Robert. "Differences Across First District Banks in Operational Efficiency." New England Economic Review May/June (1995). Tannenwald, Robert. "Massachusetts' Tax Competitiveness." New England Economic Review January/February (1994). Tannenwald, Robert. "The Geographic Boundaries of New England's Middle-Lending Markets.." The New England Economic Review July/August (1994). Tannenwald, Robert. "How Dependent Are New England's Mid-Sized Firms on the Region's Largest Bank Holding Companies." New England Economic Review July/August (1993). Tannenwald, Robert. "Cyclical Swing or Secular Slide? What Have New England's Banks Been Losing Money." New England Economic Review November/December (1991). Tannenwald, Robert. "Taking Charge: Should New England Increase Its Reliance on User Charges." New England Economic Review January/February (1990). Tannenwald, Robert. "The Changing Level and Mix of Federal Aid to State and Local Governments." New England Economic Review May/June (1989). Tannenwald, Robert. "Should Massachusetts Reform Its Bank Tax." New England Economic Review September/October (1988). Tannenwald, Robert. "Rating Massachusetts' Tax Competitiveness." New England Economic Review November/December (1987). Tannenwald, Robert. "State Response in New England to Federal Tax Reform." New England Economic Review September/October. (1987). Tannenwald, Robert. "Why Has the Unemployment Rate Declined So Rapidly." New England Economic Review September/October (1984). Tannenwald, Robert. "Are Wages and Training Subsidies Cost-Effective?--Some Evidence from the New Jobs Tax Credit." New England Economic Review September/October (1982). Tannenwald, Robert. "Federal Tax Policy and the Declining Share of Structures in Business Fixed Investment." New England Economic Review July/August (1981).